Spacious 3 bedroom, 3 bath home located on beautiful Lake Winnisquam offers spectacular views of the lake and mountains from every room! The house has 3 living areas and a large kitchen with seating for 10 as well as a laundry room on the first floor. There are 4 tvs all having cable and 3 having dvd players. Having 6 beds, the home sleeps 12 comfortably. The master suite has a king bed with full bath and living area. The 2nd bedroom has a queen bed, and a full on full bunk bed. The 3rd bedroom has 2 full beds. All baths are conveniently located outside all bedrooms. The 1st floor is equipped with Central Air Conditioning, and the 1 bedroom located upstairs has a Window A/C Unit, along with several fans throughout the house. The living room now offers a full size pool table and dart board for your enjoyment! The property has a 450' soft sandy beach where you may even see fireworks thoughout the summer months, and is equipped with lounge chairs and umbrellas, and picnic area with firepit, great for smores with the kids, perfect for long lazy days in the sun. It also features a boat launch, boat slip & jet ski ramp for your boat & jet ski if you wish to spend your time at the sand bar or out on the water enjoying water sports! Deck, large yard, playground/swing set are perfect for kids! Just minutes from Outlet Shopping, Gunstock Ski Resort, Lake Winnipesaukee, Weirs Beach, 18 hole Golf course, Mini Golf, Arcade, Drive in Theater, Meadowbrook Pavillion, many Restaurants, and much more! If you are looking for a getaway in the lakes region this home is a must see! This home is located in Lake's Edge, a lovely 14 unit beautifully maintained association. Need even more room...cross reference listing #7108469 to see cozy updated cottage in same association! Beautiful views of lake and mountains! 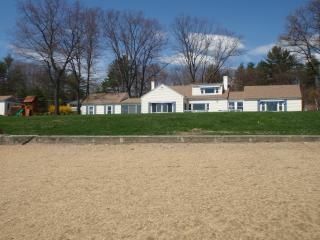 Beautiful sandy beach and yard area on Lake Winnisquam! Includes use of boat slip/dock! We second everything the previous reviews state - except the water shoes comment....we found the lake bottom to be nice soft sand and vegetation. The location is perfect as it is close to everything yet you feel like you are in a private oasis. The home is very spacious with plenty of room for 12 people to sleep comfortably & have their own space - and the 3 bathrooms are an added plus! You only need to bring clothes & food -- everything else is there including beach towels! The owner was very responsive to my questions and quick to reply. We had such a great time we hope to become annual renters. This vacation rental is worth every single penny! Wonderful family vacation home! The house is huge and very clean and had everything we needed for a week that went by way too fast. The owner was very nice and always got back to me right away. Location was great too. Many stores and restaurants close by but sitting on the deck looking at the lake you would never know it because it so peaceful. It is part of a condo association but the beach was never crowded. I would suggest future renters bring water shoes for a couple of sharp shells in the lake but other than that I wish I could have stayed 2 weeks! I'm so happy to hear you enjoyed your time at the lake! Thank you for sharing your feedback! We did not see this property before renting, and it turned out to be fabulous. Equipped with everything you could possibly want and very spacious. It turned out to be the hottest week of the summer, and every room was kept cool with air conditioning and fans that we did not have to bring. Our 5 year olds played on the very nice swing sets and our teens enjoyed the dock and very large beach area! We also enjoyed the shopping nearby. With fluctuations of 8 ->12 people during the week, we felt the house could accommodate us very well, it is so spacious inside. The outside deck was very nice with a big table and plenty of chairs with lighting that was really nice to eat dinner and enjoy family. The owners were wonderful and answered all our questions. We had a great vacation at this property and would do it again! I am so thrilled that the people sharing our home were as happy with it as we are, and even more pleased that they took the time to share their feelings with you, prospective renters! It really is that spacious a property and I'm glad that they were able to find something for everyone in the family to enjoy!I'm sure that you will too! Lake Winnisquam is approximately 12 miles long and 2 miles wide and has a sand bar for lots of family fun in the sun! Go by boat to 3 restaurants (one with ice cream parlor!) and a market with deli & ice cream! Pool table and dart board! Nightly Rate: $500 - $700 Weekly Rate: $2500 - $3800 Monthly Rate: $0 - $0 $3,500.00 for bike week and months of July (excluding the week of July 4th) and August $3,800.00 for the week of July 4th $3,000.00 for all weeks in May, June (excluding bike week), September & school vacation weeks (winter/spring) $2,500.00 for all weeks in Ocotber-April (excluding school vacation weeks) A security deposit of $500.00 is required, along with 50% of rental total at time of booking, and balance is to be paid 30 days prior to check in date. If booking within 30 days of rental, full payment is expected along with security deposit. House is expected to be left in same condition as it was received. Security deposit refundable upon inspection of property if condition is met and will be returned within 14 days of check out. Weekly rentals go from Saturday to Saturday. Check in- 3:00 PM Check out- 11:00 AM *Nightly Rentals may be available during the off season starting at $500.00 per night plus $500.00 security deposit. Minimum 2 night stay is required. Full payment is due at time of booking for nightly rentals. Not available for nightly rentals in July and August. *Attention Skiers, Professionals, Students: Also available for MONTHLY WINTER RENTALS between September and May!